Blue straw, retro-boho hat for a ceremony women turban Hat Fascinator for a derby woman for a wedding band, while rose fascinator for bridesmaid, etc. 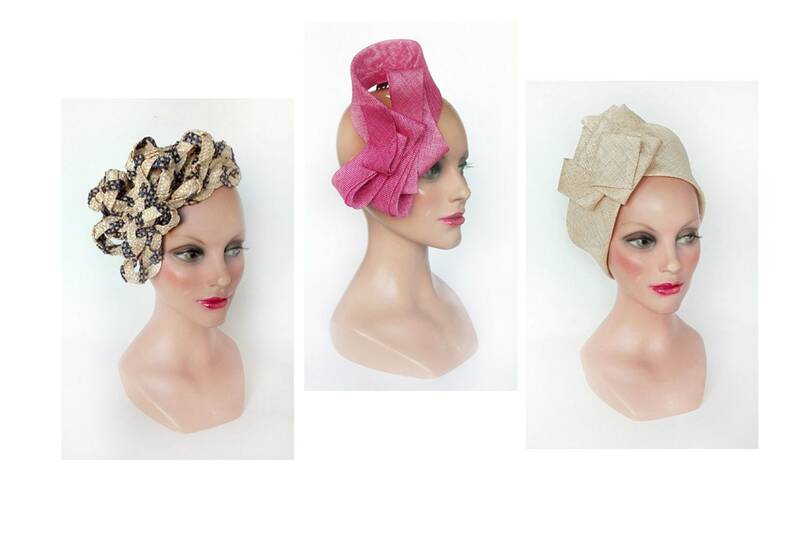 For all those who enjoy surprising in a ceremony, I offer these two hats in trendy minimalistic boho can be worn on many occasions, for a wedding, engagement, cocktail, or gift suggestion for a loved one. The beige version: hat and headband made with of against the natural. It fits a head circumference of 56 cm. The height of the front is 13 cm and 7 cm headband. The blue version: straw fascinator hat for women made of 2 shades of beige natural straw braid and fancy woven blue and beige. The headpiece is mounted on a black plastic comb 7/4 cm. Pink version: small ceremonial hat, made minimalistic vivi Lese in natural shade of pink. Keeping is done by a comb hair brown 4/5 cm. The dimensions are 6 cm high, 17 cm to tip, 14 cm wide.